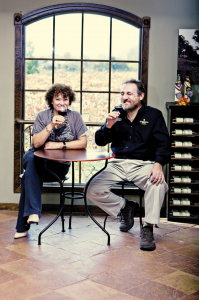 The pride poured into each Hopewell Valley Vineyards wine is palpable. Sergio Neri, master vintner of the vineyard, draws upon a family wine making tradition that extends back for generations. For many years the Neri family owned a vineyard and winery in the renowned Brunello di Montalcino region, and still today have vineyards in Tuscany located in the Chianti Classico region between Florence and Siena. Hailing from Macedonia in northern Greece, Violetta Neri also has wine in her blood. But in this unique case, from the women in her family. Violetta’s grandmother Evanthia (which fittingly comes from the word ‘blossom’ in Greek) made an archaic Greek varietal of white wine that was indigenous to the region. She stored her wine in big barrels in the cellar of their village home, that the family happily shared and enjoyed throughout the year. Evanthia’s craft and love for wine was passed down to her daughter, Evthokia, and then to her granddaughter Violetta… Given such wine-drenched heritage, the Neris endeavor to share their authentic wines with New Jersey. For them, opening a bottle of Hopewell Valley Vineyards wine uncorks the past, present, and future of fine wine. It’s the natural evolution, the next generation, the next permutation, of excellent wine making tradition.